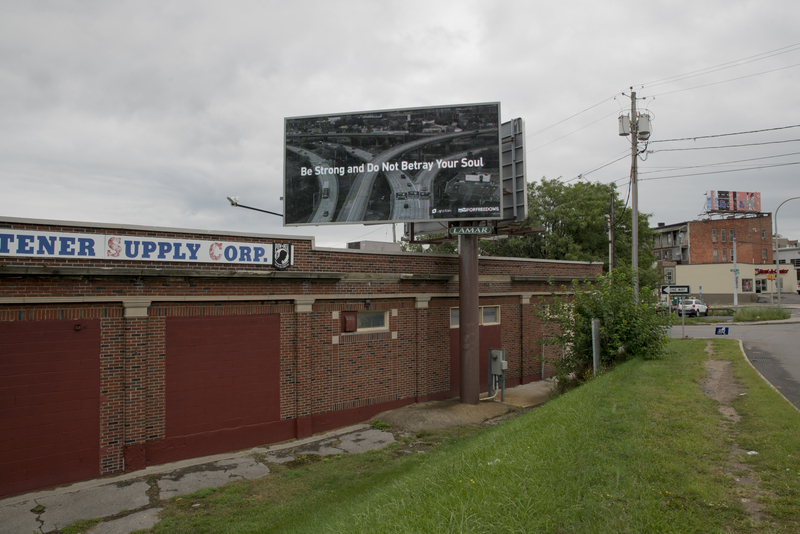 In conjunction with the forthcoming exhibition, Be Strong and Do Not Betray Your Soul: Selections From The Light Work Collection, Light Work and For Freedoms are collaborating on a series of billboard artworks in the Syracuse area. This is part of The 50 State Initiative, an ambitious new phase of For Freedoms programming that culminates this fall. 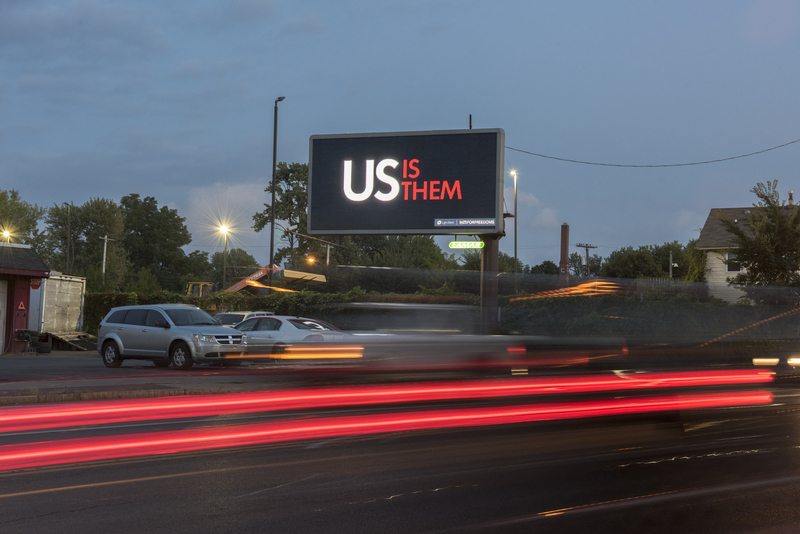 Building upon the United States’ existing artistic infrastructure, For Freedoms has developed a network of artists and institutional partners, including Light Work, who will produce nationwide exhibitions, public art installations, and local community dialogues in order to introduce nuanced, artistic thinking into public discourse. Centered on the vital work of artists, these exhibitions and related projects will model how arts institutions can become forums for civic action. 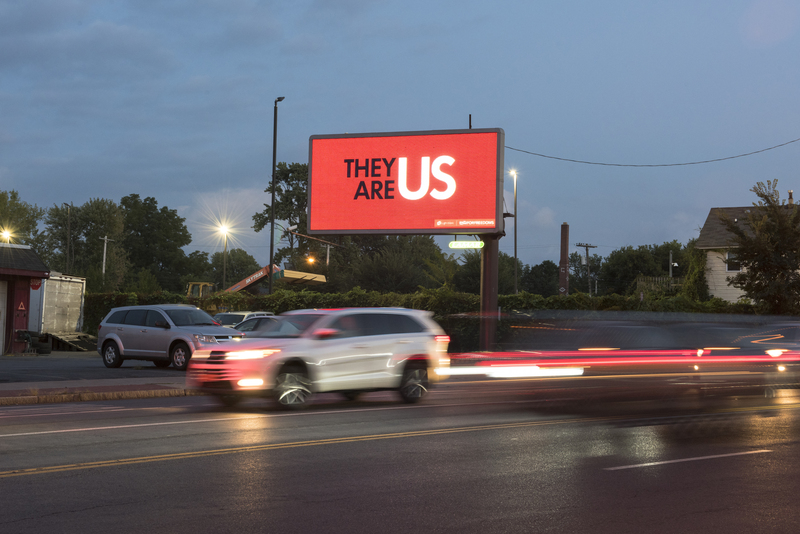 The 50 State Initiative will include the installation of a series of artist-produced billboards in public and art spaces in all 50 states, Washington, D.C., and Puerto Rico. Billboards are going up across the country this fall in advance of midterm elections, while other educational and outreach components of the initiative will occur from September through December. 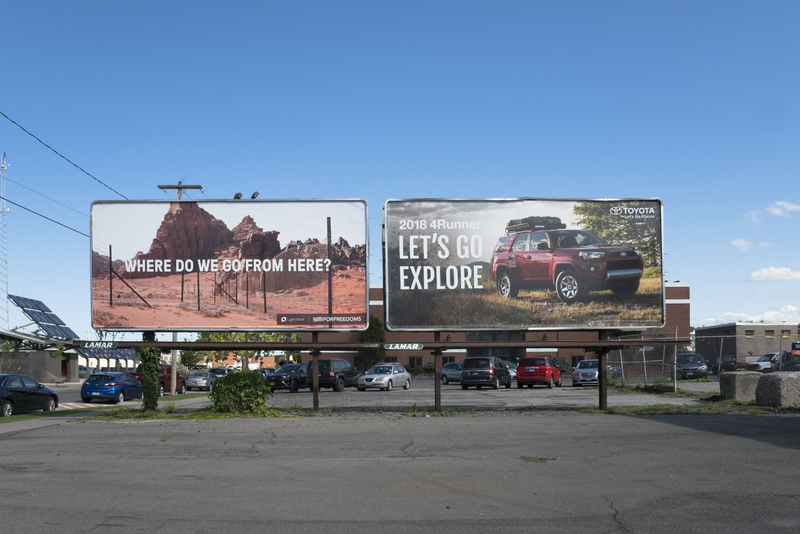 Six of the billboard installations are within the city of Syracuse, New York, and will be in various locations between August 13 – October 7, 2018. 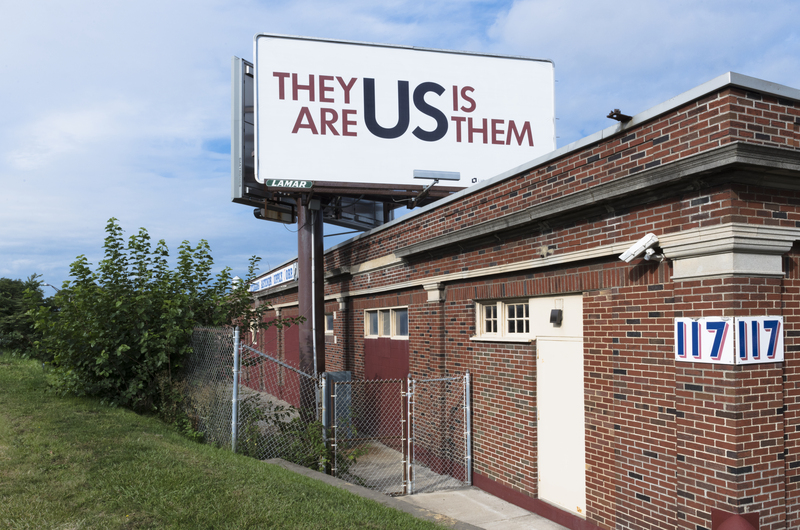 The images and text that comprise these billboards aim to provoke conversations in our community that lead to civic engagement. To help easily identify billboard locations and encourage engagement, a free downloadable map with information regarding the works on view will be available to the public. Thursday, September 20 at 6pm, For Freedoms co-founder Eric Gottesman will join us for a gallery talk about the process of curating Be Strong and Do Not Betray Your Soul and how this thematically intersects with the For Freedoms campaign artistic and art ideals. 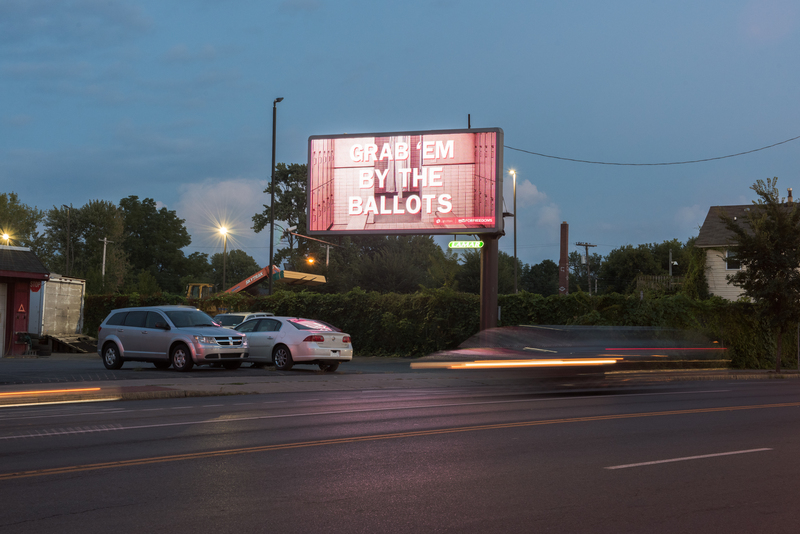 In appropriating the billboard format, these by award-winning artists invite the viewer to engage critically with the messages their work presents as well as with the medium of political and commercial advertising itself. 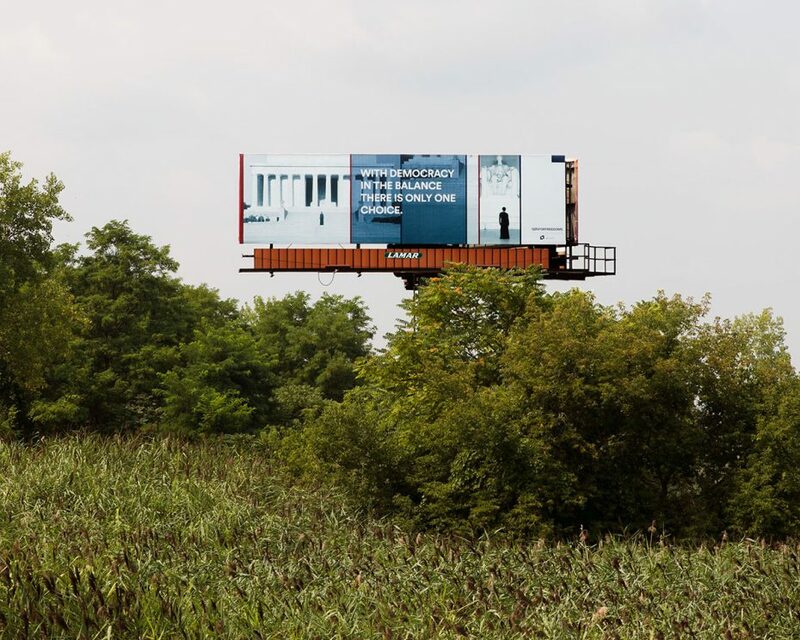 Former Light Work artists-in-residence Eric Gottesman and Hank Willis Thomas started For Freedoms in 2016 as a non-partisan platform for civic engagement, discourse, and direct action for artists in the United States. Inspired by Norman Rockwell’s 1943 paintings of the four universal freedoms that Franklin Delano Roosevelt articulated in 1941—freedom of speech, freedom of worship, freedom from want, and freedom from fear—For Freedoms seeks to use art to deepen public discussions of civic issues and core values, and to clarify that participation, not ideology, is the bedrock of citizenship in American society. For Freedoms is part of a rich history of artists employing means of mass communication to provoke political discourse. For Freedoms believes art and artists play important roles in galvanizing our society toward a more representative and transparent government. For Freedoms co-founder Eric Gottesman will share back-story about the inception of the For Freedoms and use his curatorial selections from the Be Strong and Do Not Betray Your Soul exhibition as talking points to ignite a dialogue about the various socially relevant topics. Be Strong and Do Not Betray Your Soul: Selections from the Light Work Collection exhibition and related programming are partially supported by a grant from The Central New York Community Foundation (CNYCF).